No pin holes are required in the prop barrel eliminating any stress points. The tube wall can therefore be thinner resulting in a lighter prop. The prop is easy to install in a one-man operation, no finicky pins to find holes. 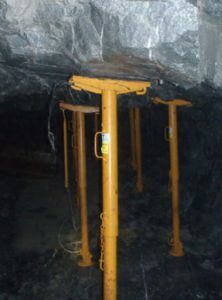 The prop is set using a conventional cam system, well known in the mining industry. The prop can be removed remotely using a cable and spanner on the cams, in conventional manner. The prop can easily be retracted by turning up-side-down and giving a light tap to release the locking mechanism. The TempRite can be supplied with a variety of headboards depending upon customer requirements. Netting hooks can be included in headboard designs. The prop has an in-built yield mechanism to protect the working of the prop during closure conditions. It will not buckle under closure resulting in loss of load. Yield loads are set at between 80 and 100kN.